Gone are the days were farmers and farming was synonymous to poverty. Not now anymore when farmers are becoming the richest people (I heard that one of the richest man in China is a farmer) and leaving the best of life possible. to most agricultural graduates and 'wannabe' farmers is laziness and procrastination. So many unemployed graduates and in the streets of urban centres who just sit around and wait for job to fall from heaven, while they waste away in poverty, hoping for a better tomorrow and opportunity to make good money through farming is actually passing them by on daily basis. The popular saying that time waits for no man. Vegetable(ugu) farming happens to be one of the easiest agricultural venture, and is always in hot demand all year round. 'Vegetable' as it is popularly called in Nigeria is Fluted Pumpkin (Telfairia occidentalis) popularly known as Ugu (It's Igbo name) across Nigeria. Ugu vegetable is by far, the most consumed vegetable of any kind in Nigeria. An acre size Ugu farm is capable of turning in above N500,000 and it will take you less than N60,000 to cultivate one acre farm of ugu. If you are in Lagos, the entire Power Line of hundreds of Acres, that stretched from Egbin power station in Ijede, Ikorodu, down to almost Ikorodu garage are really good for Ugu farming and you can get to to cultivate your pumpkin leaves(ugu) and other vegetables. Apart from cooking, pumpkin leaves, ugu vegetable has been known to increase the volume of the red blood cell when consumed fresh, without being cooked. It's blood enhancing nutrients gives it the ability to expand the volume of your blood at a very short time after consumption. 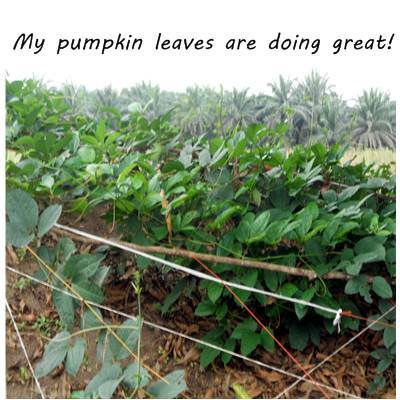 This and other important benefits makes the pumpkin leaves alias 'ugu' to be in high demand. Anyone who can cultivate Ugu, is absolutely going to make good money selling it and can be cultivated in every part of Nigeria due to its adaptability to the Nigerian soil and climate condition. Cultivating pumpkin leaves, ugu vegetables could be very easy ranging from land clearing, tilling, bed making or rushing, manure or fertilizer application and watering when neccessary. If you could raise a small garden then you could do ugu farming too. It's not much of a stress especially with farming consultant like me at your beck and call. Try out ugu farming today and see how happy you will be. Follow up on this blog we will update you on marketing. Don't forget to contact me if you run into trouble with ugu farming venture.